So I haven't talked as much as I'd prefer about indie country yet this year, mostly because of the same reason I haven't talked about much hip-hop this year - 2016 has had a bit of a slower start, and there hasn't been much that's really caught my ear. And yet there's been one artist that when the indie country sites exploded with critical acclaim, I knew I had to take a look eventually, and that woman is Dori Freeman. Born in south-west Virginia, it seemed like her situation would be the same for many indie country prospects with no real web presence - it's never good for buzz if I've got more of a following than the artist I'm covering. And then something funny happened: she was 'discovered' by Teddy Thompson, the son of the legendary singer-songwriter Richard Thompson, who pulled enough strings to get her into the studio to cut a debut album. Now keep in mind that Dori Freeman doesn't seem to have any obvious connections to the burgeoning 'New Outlaw' movement under Dave Cobb in Nashville - we could have the sort of outlier that rarely receives any attention at all if not picked up by the critical set or an indie label with ingenious promotion or something going viral. 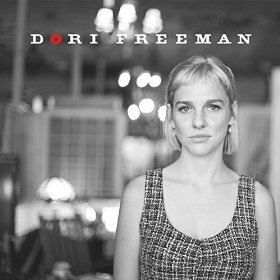 In other words, this is the sort of artist my channel is made for, so I finally got the chance to really dig into Dori Freeman's self-titled debut album - what did I get? Well, it's pretty damn great, that's for sure. And honestly, it's the sort of greatness that doesn't really need a lot of words to describe - beautifully organic and textured country that straddles the edges of traditional and folk, with smart enough lyrics, delivery and framing to highlight both intelligence and emotional complexity. Now I wouldn't say I'm blown out of the water by this record - and believe me, I'll explain why, because I totally get why indie and traditional country fans will adore this debut - but if you want the short recommendation, you should absolutely get this, if only because talent and delivery like this doesn't come around often and deserves more attention. So let's start with Dori Freeman herself, and the best way I can describe her vocal delivery is a huskier, rougher blend of Kacey Musgraves and Ashley Monroe. She's got some of the same pretense towards elegant theatricality that Kacey has, but it's tempered and nowhere near as cute, featuring a world-weariness that reminded me a lot of Ashley Monroe's work with enough rough character in her voice to highlight that maturity, the sort of wisdom beyond her years. And it helps that the vocal production is presented in a way that's intimate enough to give her the spotlight and yet spacious enough to highlight the loneliness that underscores the content, with the few sparse harmonies from Teddy Thompson only highlighting their distance further. Or to put it another way, Dori Freeman has the versatility to handle the a capella work song 'Ain't Nobody' or the more ramshackle folk of 'Fine Fine Fine', and then can turn around to handle the elegant, pseudo-soul/R&B flavor of 'Tell Me' or the smooth lounge vibe of 'Lullaby' or the exhausted waltz of the album closer 'Still A Child'. And it definitely helps that the instrumentation and production is on point too - and what's interesting is how much this album can evoke the traditional country sound in the composition without resorting to the weathered production that has become Dave Cobb's trademark. Melodically, this album doesn't exactly step away from conventional chord progressions in the guitar, but it's the accent moments around it that add a ton of flavour, the most noticeable being a jittery piano line that fills in the space. Coupled with the real steel guitar on tracks like 'Go On Lovin' or the strings that swell into that song and 'Still A Child', it's easy to get sucked into these songs, even if it never really rises above mid-tempo. And yet even on tracks that are more acoustic like 'Song For Paul' and the opener 'You Say', there's also a grounded bass and foundation that when the percussion does come through, never swamps out. Now an easy criticism of this album is that thanks to the tempo and instrumental selection that it can start to run together... and yes, I would say there are a few songs that don't quite stand out as much as they could, there is still a subtle diversity in tones that keeps the ten tracks having distinct personality, from the sandier tones on 'Fine Fine Fine' to the very liquid progression on 'Any Wonder'. But let's get real, this sort of intimate country is designed to place the most attention on our frontwoman, so let's dig into lyrics and themes. And the first thing you'll notice is that on the surface, the content does seem a bit uniform, mostly relationships that are failed or failing and her response to it - nothing new for country. What I like are the details in the framing, how on songs like 'You Say' and 'Tell Me' she seems fully aware that her feelings are unrequited and will probably never be reciprocated - there's a resigned exhaustion to most of these tracks that feels very human, whether she's being left behind or doing the dumping herself, like when she catches her partner cheating on 'Fine Fine Fine' or 'Where I Stood', the latter of which has enough subtle details to show how exhausted this relationship made them both feel. Love is very much a burden on this record, because as much as reason and logic has her make the right choices, her heart is going to make her pay, between the painful fall of 'Any Wonder' to the sad return to a partner whose too immature for her on 'Still A Child'. And yet you do get the impression it's a burden she craves - there's no moment where she throws love aside, but instead takes the mature steps where she can. Now all of this is great, but it does lead to two problems with the writing on this record, the first coming in a few moments that feel a little clumsy, most notably 'Tell Me' where she pines after a guy probably more than she should. The second and more pressing issue comes in that many of these songs feel broadly sketched, lacking in the intimate details to give them more unique personality to tie them back to her. It's one of the reasons I loved 'Where I Stood' and especially 'Ain't Nobody', which paint some very vivid pictures, and yet going for broader universality in the lyrics seems like a bit of a misstep when she's trying to stand out from the crowd. But as it is, I definitely really liked this album. If you were looking for a more consistent artist who isn't quite as cute as Kacey Musgraves, you'll probably find a lot to like about Dori Freeman, who has some great production, smart lyrics, and a subtly compelling presence behind the microphone. It's not going to be for everyone - this more traditional leaning country is definitely the furthest thing from cool or modern in the mainstream - but I found it genuinely intriguing, which for me is a solid 8/10 and definitely a recommendation. Folks, you definitely need to be giving Dori Freeman a listen - we need more women bringing intelligent content to country, and this is one of the most promising debuts I've heard in a long time.